STORM SHADOW grew up in the Arashikage clan of ninjas and was trained in the triple disciplines of invisibility, survival, and silent assassination. 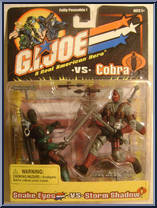 During his training, his sword-brother was SNAKE EYES, the commando and martial arts master on the G. I. JOE team. The evil COBRA organization recruited Arashikage members. This corruption split the clan in two. After a COBRA agent killed STORM SHADOW's uncle, he went undercover within COBRA to find the assassin. When the killer was revealed [to be associated with COBRA], STORM SHADOW joined the G. I. JOE Team to get revenge. But now STORM SHADOW is back with COBRA. Are all Arishikage ninjas evil? Or does COBRA COMMANDER hold some power over STORM SHADOW? Whatever the reason, his anger is clear when he meets SNAKE EYES. The battle between the ninja masters will be legendary. "A ninja moves with deadly silence and is more powerful than all your weapons combined." Contribute pictures, update details or suggest corrections for Snake Eyes vs. Storm Shadow. Write a review about Snake Eyes vs. Storm Shadow.